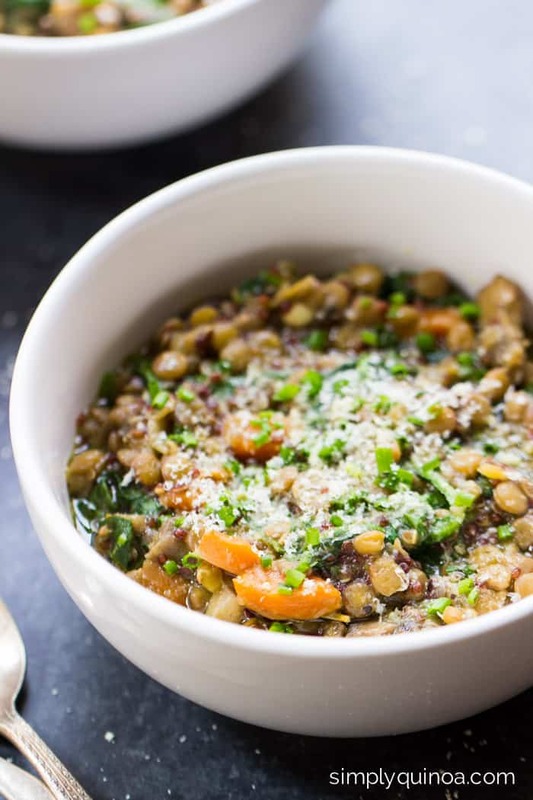 A healthy, vegetarian dish these one pot lentils and quinoa couldn't be easier. With spinach, mushrooms and lots of herbs, they're flavorful and delicious! It’s official. I’ve launched us into Fall. I hope you can forgive me. 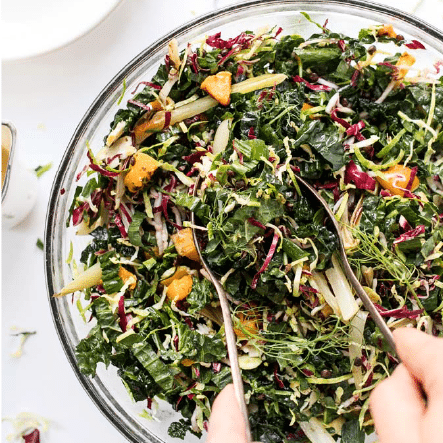 Even though we’re only a few days into September, and it’s still sweltering here in the City, my mind has moved from light, airy salads and onto the wonderfulness that is autumn cooking. 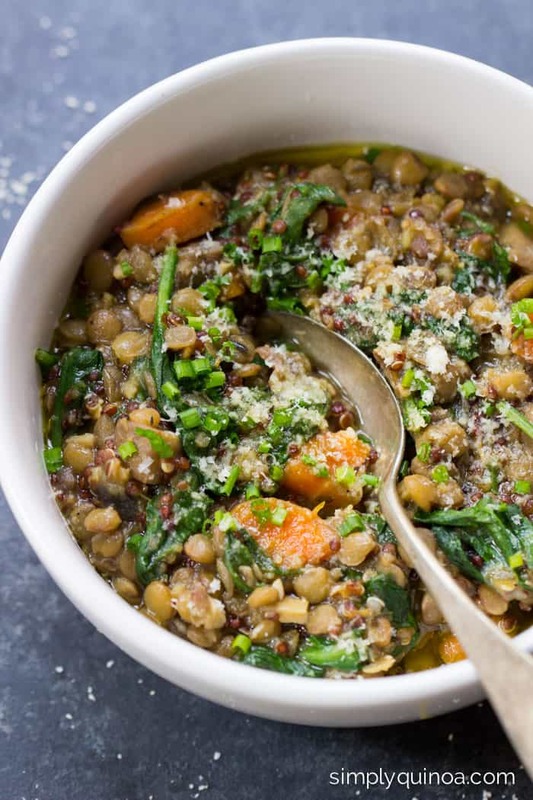 In particular cozy bowls of beans mixed with hearty veggies and quinoa. Like today’s one pot lentils + quinoa. They’re warm and comforting, like a bowl just wraps you up in a big food hug. Not to mention it’s filled with nutrients. It really is one of those meals that nourishes you from the inside out. Now I just have to say, lentils have not always been my favorite thing. 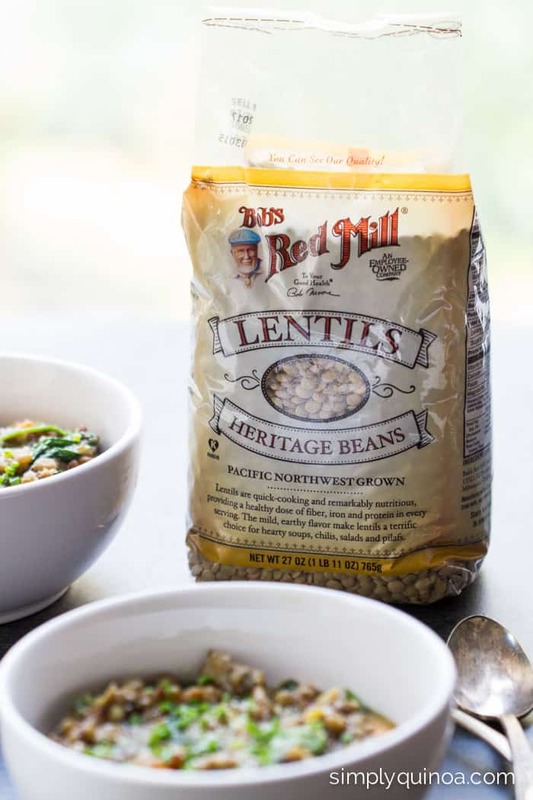 They were certainly not on the top of my list when it came to beans (gimme all the chickpeas and black beans), BUT now that I’m eating more plant-centric, lentils have become a go-to protein source for me. I always have some in my fridge ready to be tossed in a salad, wrap or just eating with a bit of salt and pepper. They’re just easy. And SO good! Oops that was eleven. But they deserve it. The lentils I used in today’s recipe are from Bob’s Red Mill and are definitely my new variety. I usually opt for French Green Lentils, but these ones, which are lighter and have a yellow hue to them, are spectacular. 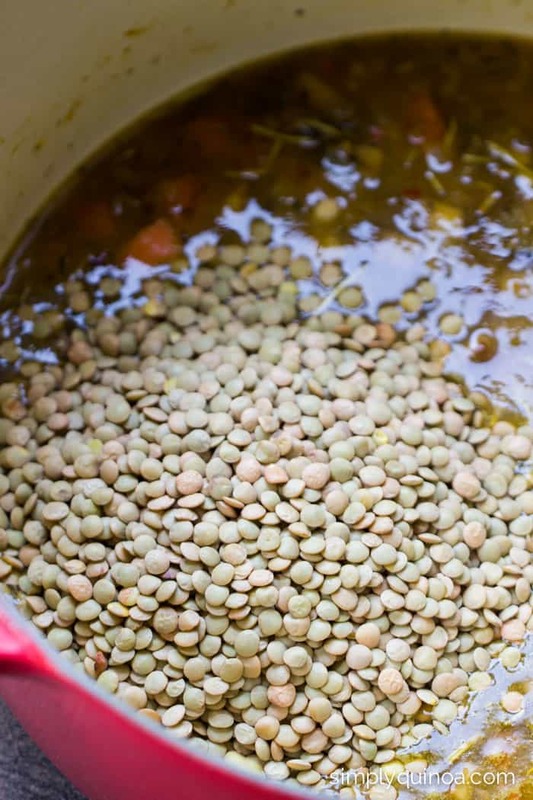 They have a milder flavor which I really like because that means you can add them to all sorts of dishes and unlike other types of lentils, they really hold their shape when they’re cooked. They have a super creamy texture and absorb other flavors like it’s nobody’s business. 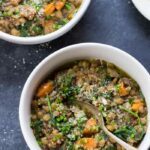 Since this one-pot meal has loads of dried herbs, the lentils soaked it all up and brought everything together. Super simple and super delicious! I don’t know why I don’t make many one-pot meals around here. They’re kind of brilliant. Clean up is a total breeze. If you follow me on Snapchat (👻alyssarimmer <– come snap with me! ), then you’ve seen my kitchen after a day of recipe testing…not pretty. SO. MANY. DISHES. It’s the worst. 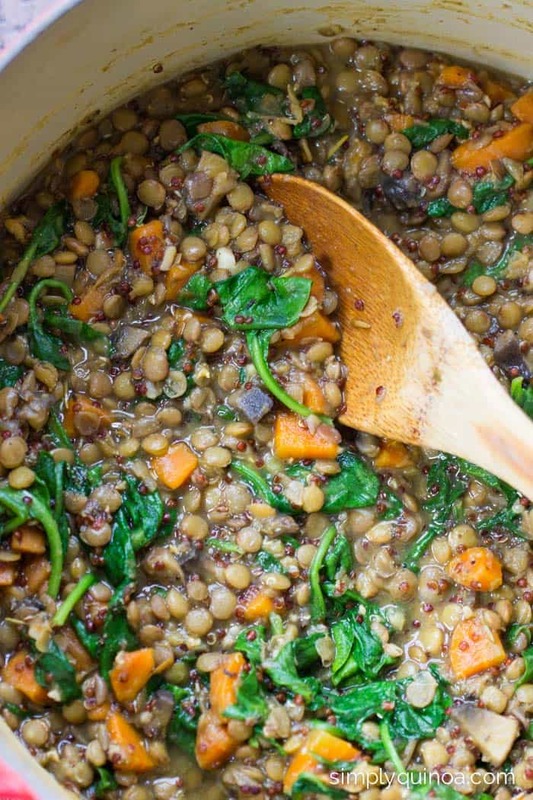 Okay back to the topic at hand: one-pot lentils. As you’re working through the recipe, I want to suggest that if you can, use a Dutch oven or some other cast iron pot if you have one. I find that when you make something like this in a traditional sauce pot, you don’t get all those gorgeous brown bits on the bottom which is where a lot of the flavor hides. 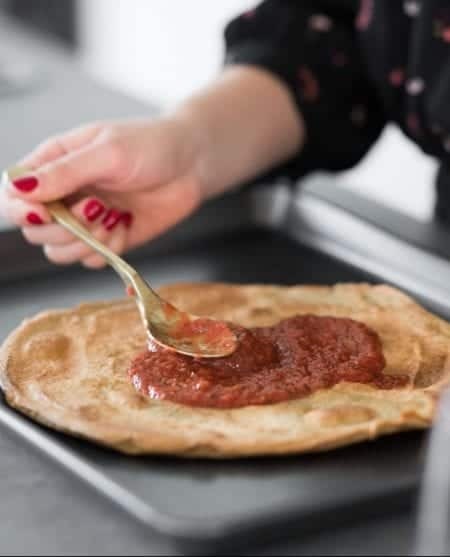 So using a big pan like this one will really help you capture all the aromas and flavors from the ingredients. Also, if you don’t need this recipe to be vegan, you could totally use chicken stock in place of the vegetable stock and it would still taste amazing. Oh and you could also substitute any type of greens you want. I went with spinach because I love it, but it would be awesome with kale, chard or even collards. I’ll let you do you. Once you’re ready to serve the lentils, might I suggest you drizzle with a generous helping of olive oil, so fresh herbs (I used chives) and some freshly grated parmesan cheese? You won’t be sorry. But wait…cheese? On a vegan recipe? It’s freshly grated cashews, which a) totally looks like cheese and b) is freaking amazing! I’m doing this on all my pasta dishes from now until forever. 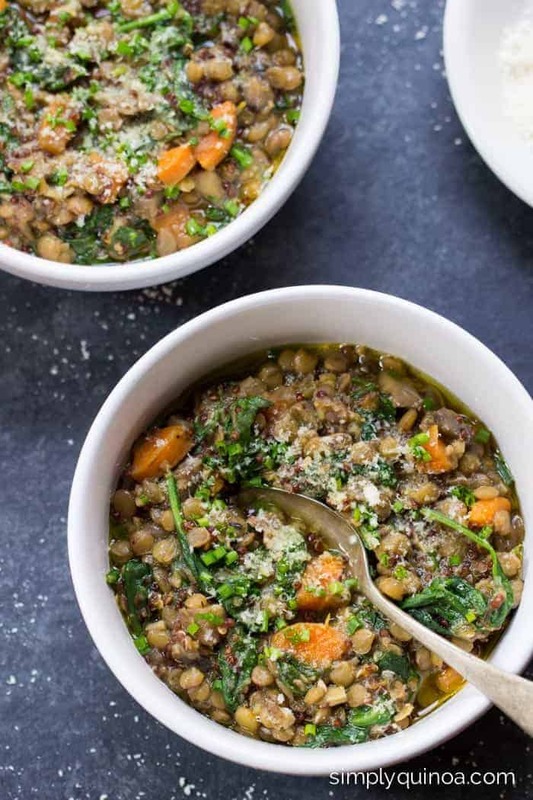 For this exact moment though, it’s just the perfect ending to this comforting bowl of lentils. Heat the oil over medium heat in a large Dutch oven or cast iron pot. Add shallots and carrots and cook until the carrots have started to soften, about 3 - 4 minutes. Add mushrooms and continue to cook until mushrooms are juicy and tender, another 5 minutes. Add garlic, red pepper flakes and herbs. Stir around until the whole mixture becomes fragrant, about 1 minute. Pour in lentils, broth, 2 cups of water and miso (if using). Bring the mixture to a boil, cover and reduce to simmer for 15 minutes. Remove pot from the heat, uncover and add spinach, stirring gently to combine. Taste (carefully!) and season with salt and pepper. Serve with a drizzle of olive oil, fresh herbs and grated cashews. The miso adds a great umami flavor, but you can just use sea salt if you don't have miso. You can also totally use parmesan if you want! This post was sponsored by the awesome folks Bob's Red Mill! They're lentils are Make sure to check out their entire line of products – there's tons of amazing gluten-free options. Thank you for supporting the brands that I am passionate about, it allows me to continue to produce these recipes for you! Is it possible to make this in a slow cooker? If so, how long would I set it for? Made this for lunch with my roommates on a snow day and we were impressed with how delicious it looked and tasted. I was skeptical about drizzling it with olive oil while serving it, but the light coating brought out the earthy flavors perfectly. We added sliced brussel sprouts and simmered it a bit longer to soak up all of the broth. The grated nut topping was fun to make and sprinkle onto our grain bowls! Thanks for this awesome recipe! I’m so glad you liked it!! And the addition of brussels sounds absolutely amazing! This was a very good dish! Can I use frozen spinach instead? hooray!! so glad you both enjoyed it! This is absolutely delicious and so easy!! Will definitely be making again soon! Thanks for the recipe 🙂 I would say this is a year round recipe!! I don’t eat mushrooms. What can I substitute??? You could either leave them out or substitute something like cauliflower or potato! Yay! What a great recipe! I studied abroad in Chile a little over a year ago and my host mom made a dish almost exactly like this and it was one of my favorite things I ate while I was there!! So thank you for letting me feel some nostalgia 🙂 I changed things a bit to copy her more closely and added some sweet potato as well as onions to this recipe! I also ended up simmering it all at the end for an extra 10-15 just to soak up a little bit of the excess water/broth and cook the quinoa and lentils a bit more. Super yummy!!! Thanks again! Sounds lovely! So glad you enjoyed it, Brianna! Always looking for a new recipe and this was so yummy, savory, filling & easy. I added shredded kale with the spinach & topped it with avocados as some I had were super ripe & I really loved your cashew idea. I made some extra cashews & jarred them for later. 😀 This took about 55 mins start to finish. That seems about right when dealing with lentils/quinoa. I think next time I will add more greens & maybe top with some tahini dressing or cashew cream & my hubby requested a side of cooked potato. Thanks for the recipe. I also enjoy your vlogs. I’m so happy you enjoyed it!! 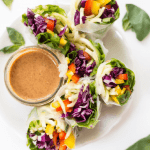 It would be so yummy with a little tahini on top…yum! Exactly what I was looking for, thanks for sharing! I added a couple of dashes of red wine vinegar and fresh avocado. Think this would work in a slow cooker? I think so, but I haven’t tried yet! I followed all the times and measurements. The lentils were mush by the time the liquid was soaked up, a little over an hour later, even after the quinoa was added. 2 stars for flavor. Sorry it didn’t work out for you! I’m not sure what might have gone wrong… others haven’t had that same issue! What kind of fresh herbs do you recommend? I think parsley, basil, sage, tarragon or even rosemary would be good! I started a pescatarian diet a couple weeks ago, and I’ve been looking for staples. This will definitely be one of them! I added an extra teaspoon of red pepper flakes. Thank you. Came out yummy. I’m going to add some tomatoes just before the end of the cooking and serve with some yoghurt. Thanks! YUM! Love the idea of potatoes 🙂 Glad you enjoyed it! Although I usually end up substituting a ton of stuff (broke and busy college student here) I absolutely love this recipe at least as for loosely following in order to make a good soup with whatever I have on hand! I’ve made it a few times, a bit different each time depending on what I have at the moment, and it’s always turned out great! Hi! How long will this keep in the fridge? Do you think it will freeze well? I like to meal prep for the whole week and typically freeze my meals that are eaten at the end of the week. Thanks for sharing! Yes! Definitely can be frozen 🙂 And I think it lasts like 4 days in the fridge! I just made this for lunch and I am in LOVE with the flavors, how easy it was to make, and how HEALTHY it is!! I’ve already shared this recipe with 4 friends. 🙂 Thank you! Thank you, this is just what I looking for! Love that it’s all in one pot. My only little tweaks: I added a bunch of chopped zucchini, probably about four cups. It could have handled even more, I would put in even more and other veggies next time. I added it at the same time as the quinoa. Spices: I had Italian herbs on hand so used those, it just includes basil along with what you listed. I also threw in about a teaspoon of cumin. No miso, but a teaspoon or so of coconut aminos. A note for others: if you don’t like heat at all, leave out the red pepper flakes. Just that half teaspoon does give it a noticeable spike. Perfect for me, but if you don’t like that, adjust accordingly. 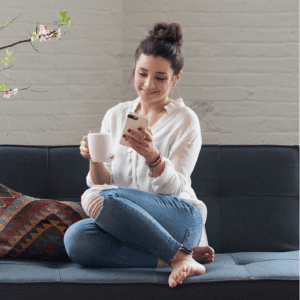 It seems like this recipe is a great base from which to be creative, which I love. Thanks again! I love that you were able to change it up! Thanks so much for letting us know what you substituted; LOVE the idea of zucchini!! Finally made this tonight and it was too spicy for me so I am going to double the quinoa and triple the lentils (cause I am trying to be replace meat). Hopefully that will dilute the spice in the batch I already made. Pour in lentils, 4 cups water and bouillon cube. Divide into 3 equal servings and refrigerate for 3-4 days. I’m trying this tomorrow ! I made this last night for dinner, as the recipe stated with the exception of the miso and it was outstanding. 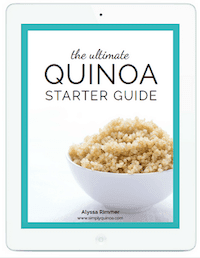 New to the vegan world and changing my diet due to lupus. Thank you so much for sharing. Do I need to cook my lentils first? Thanks! Nope, the lentils are cooked in the pot! Sorry it took longer than expected! Maybe next time cook it on a little bit higher heat. And it is a bit soupy, so I don’t think I let all the water be absorbed from mine. Glad you enjoyed it! While the dish was delicious, I think the recipe really underestimated the time it takes to make. I’m no stranger to the kitchen, and it still took me 20 or more minutes to prep all those ingredients, much longer than 3-4 minutes to soften the carrots (more like 15), and another 10-15 to cook the mushrooms until they released their water and were tender (rather than 5 mins). So that, plus the 30ish mins for the lentils and quinoa made it closer to an *hour* of cooking time. If the recipe had been accurate, I would have saved this for a weekend when I had more time rather than a weeknight when I can’t be spending an hour and a half in the kitchen. Sorry it took longer than you anticipated! I tend to cook my veggies on fairly high heat and that was the amount of time it took me. Of course, every cook is different, so it’s hard to judge for others. Glad you enjoyed it! Ah, I see. I cook mine on medium in my enameled cast iron because I don’t want to damage it. The flavor was really earthy, as expected, so I added a few capfuls of lemon juice to brighten it up a bit. The flavor of the leftovers was even better after it had time to cool and let the spices meld! Made this for lunches this week, absolutely delicious! Looks delicious. I can’t wait to make this. One note on the miso use; to preserve the nutritional benefits of the fermentation process, add miso after cooking, right before serving. Thanks for this recipe!! I love all of the flavors + herbs going on in here!! And especially since it’s all cooked in one pot, all the ingredients can meld and I bet it tastes amazing! 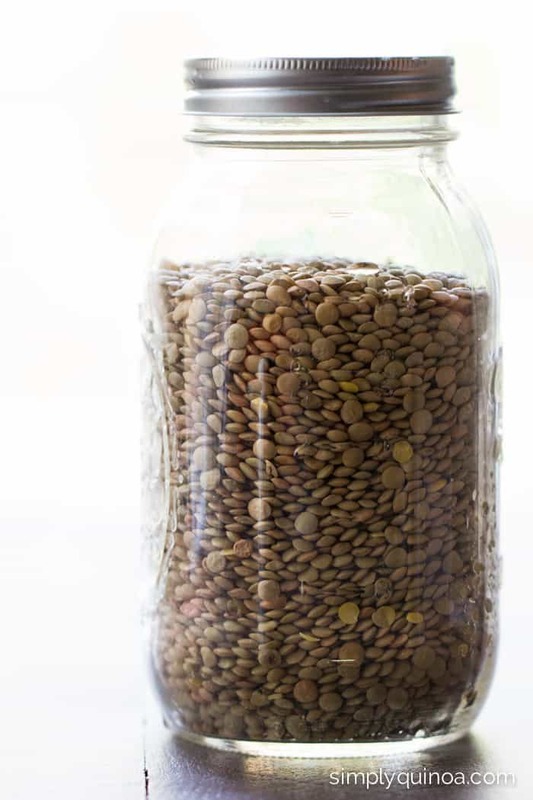 How long do cooked lentils last in the fridge? I know you usually use a lot of pre-cooked quinoa in your recipes, but is this quinoa uncooked when you add it? Great flavor. I ove mushrooms. Not a fan of them in this dish. Bad blend of textures.